With ten days to go until the National Football Leagues 2014 Draft "the Miami Dolphins are on the clock!" Eighteen selections have been made! All of the immediate starter prospects of absolute need and desire that Miami had targeted for pick #19 have already been chosen! (The top 4 Tackles including Zack Martin, Receivers Sammy Watkins, Mike Evans, the OLB's Mack, Barr, and Tight End Eric Ebron are all gone)! The BPA (Best Players Available) are perhaps a Defensive tackle or two, Middle Line Backer C.J. Mosley, and Safety Hasean (Ha-Ha) Clinton-Dix, though they are not at positions of absolute dire need, nor may they make the 2014 Dolphin starting lineup. The MLB position is the defensive quarterback, a tough nutt for a rookie to crack, while the Safety and DTackles would be nice options if something were to happen to the current slated to be veteran starters. There are other prospects that are projected to be first year NFL starters at positions of absolute immediate need for Miami. Players that are ranked slightly lower than the suggested to be BPA's at 19, and those players can be had between the first rounds overall mid-twenties to the early second round forties. Here are a few potential Miami Dolphin trade down from nineteen candidates. 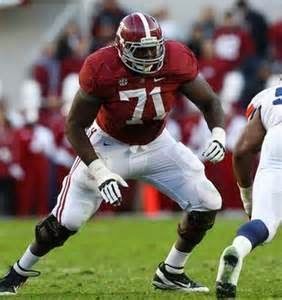 Cyrus Kouandjio, pronounced "KWON-joe" is a 6-7, 322 pound Junior out of Alabama with a mere 16% body fat "reportedly". He played in eight games as a 2011 freshman before an ACL/MCL knee injury. In 2012 while allowing just 3.5 sacks in the physical SEC. He started all 14 games at Left Tackle for the Nationally ranked 16th best rushing team, and Collegiate Champions. Cyrus started at Left Tackle in all twelve games for Nick Sabans 2013 Alabama team while being voted a Consensus All-SEC First Team, and All-American selection. Though "RAW" with tons of upside at 20 years old! He was included in conversations of the 2014 elite tackle prospects until a horrible showing at the combine. Maybe, he just plays better than he test? Kwon-Joe is a big NFL ready, lean, mean, run blocking machine for a team in need of a road grading Right Tackle. He also possesses the length among other required (during the game) tools to evolve into an athletically agile, elite NFL pass protector. In a trade down scenario from pick 19 to (24 thru 33), Cyrus "Kwon-Joe" and an additional (respectably 3rd or 2nd round) prospect would be viewed by most as a well surveyed path. 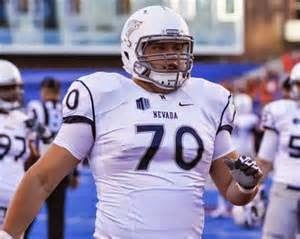 Joel Bitonio a Senior at (22) stands 6-4, 302 as a team captain that has started at Left Tackle for Nevada's Wolf Pack in 39 consecutive games, (2010 thru 2013). Joel display's phenomenal leadership skills, work ethic, is reliably tough, and plays through the whistle with savage intensity. He is also quite athletic. At the NFL combines test of explosion, and agility. Bitonio was the valedictorian of offensive lineman as the leader in all five measurements of athleticism, (Vertical, Broad jumps, three cone, 20 yard shuttle drills, as well as the forty yard dash). Bitonio has the versatility to play right tackle or guard, but similarly to the preferred Dolphins pick at the current number 19 spot of Zack (T-Rexx) Martin. 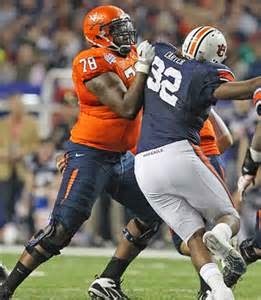 (Bitonio may be a bit undersized in length) to excel as an NFL tackle? He would be a steal at either position for the Dolphins between picks 34 and 44. Especially with the included compensation of an additional low to high second round starting prospect for trading down 15 to 25 spots. A drop from 19 to pick 44 would accrue an additional pick at number 48 which would give Miami three second round picks between 44 and 50. Miami has their our own pick at number 50. Maybe, he will be there, if all else fails? Morgan Moses is a big, long armed, nifty footed 6-6, 314 pound Senior. He has started 43 games for the ACC's Virginia Mountaineers including one as a 2010 Guard, twelve as a 2013 left tackle allowing just two sacks in 506 pass attempts, and thirty at Right Tackle (2010/11/12). During the 2010 thru 2012 seasons he started for the then Virginia Offensive Coordinator, and current Miami Dolphins Offensive Coordinator Bill Lazor. With seven games remaining in the 2010 season Moses became the starting Right tackle for a offensive line that had run up a tab of 17 sacks over the previous 22 quarters. Upon his insertion the unit allowed just 6 sacks over the remaining 28 quarters of the season. Bill Lazor is with whom the conclusion to whether or not General Manager Dennis Hickey will draft the overall 37th ranked prospect Morgan Moses at pick 19, or in a potential trade down scenario that would include additional value of himself as well as another high draft pick for the Miami Dolphins. Who do you like of this compilation, or from within your own mind? The Dolphins First Round pick at number 19 is worth 875 draft trade value points! To trade down from 19? Miami would (first off) have to find a willing team to trade with. That particular team would have to possess two or more later picks of which their total worth nears the 875 "draft trade value" of pick 19! (For instance). If Miami were to trade down five spots from 19 to 24? (Or somewhere in that general vicinity that includes Kansas City, Cincy, and San Diego)! Equal value would suggest that the Dolphins would get #24 and a bottom of the third round pick in the early 90's that the above mentioned teams are also in possession of. Trade down ten spots and the value chart suggest that you deserve the 49'ers pick #29, and an additional pick near #71 which is also in SF's early third round selection vicinity. Miami from 19 would have to trade entirely out of the first round, and into the early thirties (Texans, Redskins, Browns, Raiders, or Atlanta) to accrue an additional bottom of the second round choice near pick sixty that the previously mentioned are also in possession of. This type of move would obviously eliminate the first round option, but would give the Dolphins three second round picks, (two via the trade down), and their own at number 50. If one can find a willing trade partner? So. Do you as the Fin General Manager take the BPA at 19 (no-matter the position, or need)? Or do you "Trade Down" and get the BPA (at that point) for a prospect/position of dire need while accumulating additional later round picks as well as potential starters? (Not saying that teams live and die by this chart), but it is a good reference point for us fans to understand what additional picks can be gathered by trading down, or up, (from wherever). Can you find a team with two or more picks of combined similar value to the Miami Dolphins pick number 19? Thank You for an Open Minded Read, and we look forward to your angle of view! !